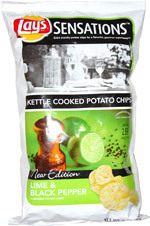 Taste test: These kettle-style potato chips had a lot of flavoring powder on them. There was a good amount of pepper taste, and the hint of lime did come through. It tasted like you took a pepper-flavored potato chip and squirted some lime juice on it. 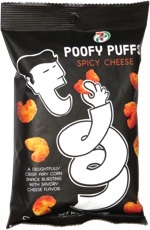 The pepper flavoring left a pepper-spice kick in the mouth long after the chip was swallowed, so if you like a hot aftertaste, you'll enjoy these. I'm not sure how the combination of lime and pepper is supposed to work. There aren't a bunch of lime and pepper dishes (especially with potatoes) that this is supposed to emulate, but there's nothing offensive in these chips if you like the taste of pepper and/or lime. Smell test: You can smell the pepper when you open the bag. You can't smell the lime.